First of all, you don’t gain levels, you have to find powerups. That’s not so bad, to be honest, but it really could work better. In fact, it would work better if combat were more true to the standard Ys gameplay - there SEEMS to be no avoiding taking damage when you slam through an enemy in an attempt to destroy ‘em. I’ve managed it once or twice, to be honest, but it seems to be exceedingly random. 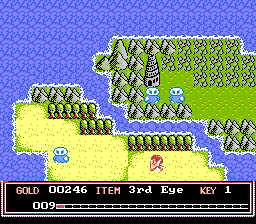 This means that, at the beginning of the game, you can take out 30 enemies or so before Silviana is toast. 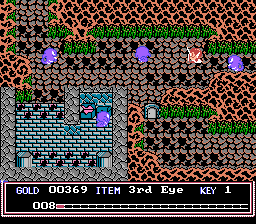 When you get into the cave, the damage the enemies do approximately triples and you’re extremely lucky if you survive past the third or fourth screen. I’m afraid I didn’t play too far in it, so I’m probably not the best person to review it, but the rather steep difficulty curve turned me off early. Who knows though, you might be better at it, or maybe it’s just NNNesterJ running kinda choppy for me. It’s worth a shot anyway, just to see if you like it or what. 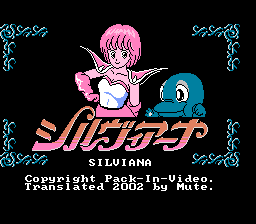 This is an English translation of Sylviana: Ai Ippai no Boukensha for the Family Computer Disk System. Headerless version of this rom is D0190D07. You MUST apply this patch to a rom with a header. If you apply it to one without a header the FDS BIOS will give a "Disk Trouble ERR.24" and will not load the game. Find a version with the header, or add the header below to the file with a hex editor.